You have been there to support your runner throughout their training, but what do you do on race day? How will you track your runners progress? Can you be there to chEAR them on at the end of their run? How can you continue to be a part of their big day? What is ChEAR Squad? It is Disney's answer to helping you support your loved one on race day. There are 4 packages available ranging from free to $115. Here's is what's included with each ChEAR Squad Package. E-Newsletter detailing all of the weekend events. Entry into the Finish Line ChEAR Zone. Temperature controlled tent with indoor lounges & family style seating. Internet access to check live results. Live video feed from the Finish Line. You can track your runner throughout the race via Runner Tracking. This is a great way to keep up with how your runner is progressing in the Marathon/Half-Marathon, you can sign up for this service via the runDisney Real Time Alerts on their website. Want to view your runner during the race? Here are the runDisney recommended viewing spots. Near Cinderella Castle at Mile 5.3. This location will be open at 5:30AM and you don't need a park ticket, you do need a ChEAR Zone wristband to enter the ChEAR Zone area. You must purchase a ticket to enter the other parks, and you cannot enter them until they are open for the day. You can use Walt Disney World Resort transportation to travel between parks. There are a limited number of complimentary seats available at the finish line, but they are on a first-come/first-serve basis. I definitely recommend purchasing a ChEAR Squad package!! The Finish Line is located in the Imagine Lot at Epcot. When you enter the park a Cast Member will be able to direct you to this location. Speaking of the Finish Line - don't forget to make a sign to ChEAR on your favoite runner!! Here's mine!! And a funny one from Donna's Disneyland Half Marathon. 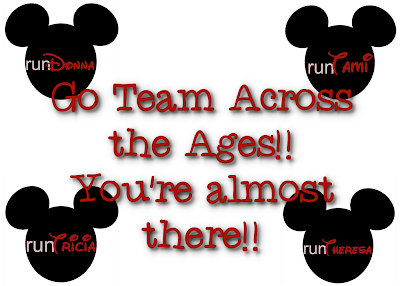 Here's a funny one from Donna's Disneyland Half-Marathon. As you can see Disney does a great job of making sure everyone is a part of the Walt Disney World Marathon Weekend!! And to all of my runDisney friends I promise I will be ChEARing you on from Troy!! I have not run in a runDisney event, but I did head into the Magic Kingdom to "chEAR" on some people during the 2012 Princess Half. It was an amazing experience to hear all the cheering and inspiring to see all the runners make their way through Main St.! Someday I will run one, but for now, I am definitely in the chEAR squad! Oh my goodness I saw the Twerking Miley sign at two different places during Disneyland and I loved it (I'm glad they moved...gave me something to laugh about at the end of the race)!! That sign was hands down my favorite! Great post about the ChEAR Squad...we've never been a part of it in the past but might have to do so in the future. I am a ChEARleader for now, but some day I really want to join you guys!! I love that disney makes a point to get everyone involved on race day and Cheer squad is a great way to do that! One of the things Disney does best in my opinion!! I bought the Platinum ChEAR package last year to ChEAR my husband through the marathon. I loved it! The viewing area at the Magic Kingdom was so awesome, they had coffee and hot chocolate available and there was lots of room. I won't be ready to run anytime soon but would love to do this to support my runDisney friends!! As a runner, let me tell you there is nothing and I mean NOTHING better or more motivating than to see masses of people (yes, they are complete strangers) cheering for you. It always gives me that little boost I need to push through a difficult spot. ChEARleaders are the BEST!! I am truly in awe of all of you runners!! I saw a lot of "you are doing great stranger" signs while preparing this post. The ChEAR leaders are so supportive of EVERYONE!! 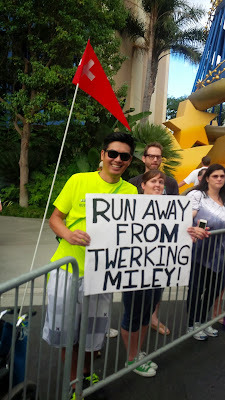 I love that Miley sign! I cheered on my husband a few years ago - I loved being in the Magic Kingdom at 5 am, hanging with Lou Mongello, and eating a fatty-fat sandwich from Casey's Corner while elite runners ran by with their 5 minute pace! Fun to cheer for everyone! I would love to be there to ChEAR all my friends on, maybe do a run since it is on my Disney Bucket List. Donna, you have the perfect perspective for this post on ChEAR Squad. While I've had rooters on the course, none of them have gone this route. I think maybe I need to sign up; whooping it up for others is FUN, and really does propel runners towards the finish. Thank you so much for always supporting me Donna- I love our friendship! !